Amazon.com description: Product Description: In Time Series Analysis and Adjustment the authors explain how the last four decades have brought dramatic changes in the way researchers analyze economic and financial data on behalf of economic and financial institutions and provide statistics to whomsoever requires them. Such analysis has long involved what is known as econometrics, but time series analysis is a different approach driven more by data than economic theory and focused on modelling. An understanding of time series and the application and understanding of related time series adjustment procedures is essential in areas such as risk management, business cycle analysis, and forecasting. Dealing with economic data involves grappling with things like varying numbers of working and trading days in different months and movable national holidays. Special attention has to be given to such things. However, the main problem in time series analysis is randomness. In real-life, data patterns are usually unclear, and the challenge is to uncover hidden patterns in the data and then to generate accurate forecasts. 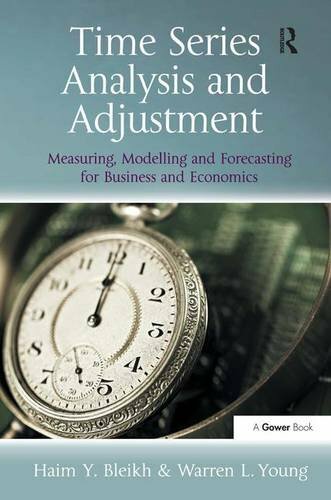 The case studies in this book demonstrate that time series adjustment methods can be efficaciously applied and utilized, for both analysis and forecasting, but they must be used in the context of reasoned statistical and economic judgment. The authors believe this is the first published study to really deal with this issue of context. About: In Time Series Analysis and Adjustment the authors explain how the last four decades have brought dramatic changes in the way researchers analyze economic and financial data on behalf of economic and financial institutions and provide statistics to whomsoever requires them.